The NHS has lost nearly 4,000 senior nursing posts since 2010, putting patient care at risk, warns the Royal College of Nursing (RCN). The void includes ward sisters, community matrons and specialist nurses and has been brought about by cost saving reorganisation, it says. 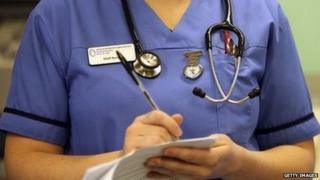 The Department of Health says it is putting more nurses on wards. But Labour accused the government of putting cost savings before patient safety. The NHS is in the middle of a tough drive to save £20bn by 2015. The government has claimed this can be achieved through efficiency savings and the frontline should not be harmed. According to the most recent data, in November 2013, the NHS was still short of 1,199 full time equivalent (FTE) registered nurses compared with April 2010. The RCN says that hidden within wider nursing workforce cuts are a significant loss and devaluation of skills and experience in the NHS, with 3,994 FTE nursing staff working in senior positions. These band seven and eight nurses - matrons, ward sisters and advanced nurse practitioners and clinical nurse specialists - have been disproportionately targeted for workforce cuts and found their roles increasingly devalued, it says. Dr Peter Carter, chief executive and general secretary of the RCN said: "As more patients require complex care from specialist nurses, letting so many years of skills and experience vanish from the NHS is an utterly reckless policy. "These cuts are a short-term attempt by trusts to find efficiency savings, yet they will lead to a very serious and very long-term crisis in our health service." The public inquiry report into Mid Staffordshire Foundation Trust, written by Robert Francis QC, highlighted the importance of having the right staffing numbers and skill mix on wards. According to the Department of Health, an extra 2,400 hospital nurses have been hired since the Francis report, with over 3,300 more nurses working on NHS hospital wards and 6,000 more clinical staff overall since May 2010. Health Minister Dr Dan Poulter said: "We know clinical leadership by healthcare professionals matters - that's why we're investing £40m in leadership training for ward sisters, senior nurses and midwives to create a new generation of leaders in our nursing workforce." Dean Royles, chief executive of the NHS Employers organisation, said: "Judging the quality of care by the numbers of one particular staff group may be attractive to a nursing trade union but we also need to have a look at what skill mix gets the best outcomes for the patients. "These simplified figures help to tell part of a very complex story. Cash is flat, demand is rising, the way we care for people is changing and other professions like physiotherapists, dieticians, scientists and occupational therapists play a huge and often under-appreciated part in delivering quality care. Local nurse managers and their employers are doing a remarkable job in challenging circumstances and developing new models of care." Andrew Gwynne MP, Labour's shadow health minister, said the government had wasted billions on a "top-down reorganisation of the back office". "While we know that good ward leadership is important for care quality, it is clear that the government has not learnt the lessons of the Francis Report. Patients are paying the price for their arrogance." What is the Francis effect?